Patricia Veals Photo – Request for information – See note below. I have received an email from Patricia Veal who lives in Cheltenham in Gloucestershire attaching the above photograph. She has given the information below and is asking if anyone can help her further. Above is a photograph that was taken a little before 1928 showing part of a building (residential house?) and a group of people. There are tennis rackets suggesting a tennis court (?). I am keen to put a name to the house and also the people. 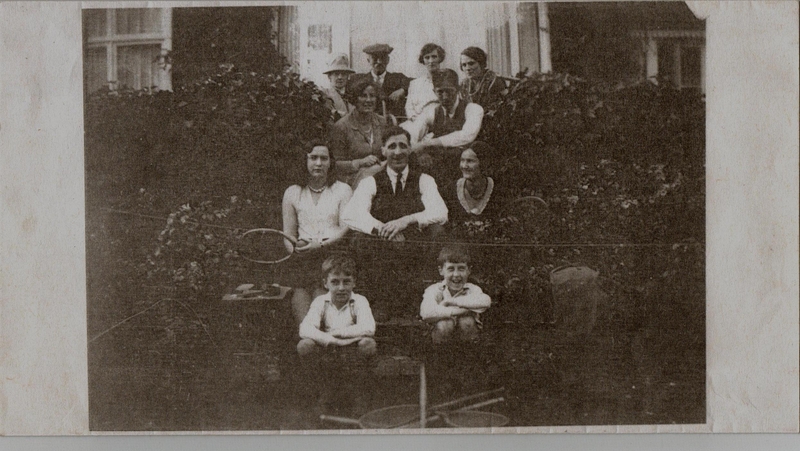 The young lady in the second row to the right hand side of the man seated is my Grandmother Ellen Burns. From information I have on a 1928 birth certificate with the details of the mother Ellen Burns was a Domestic Servant living at 14 Upperthorpe Road, Killamarsh. She was not from Killamarsh, but County Durham. No name for the father but I believe he was from the Chesterfield area. The address of the birth was 12A Newbold Road, Chesterfield in March 1928. Could 14 Upperthorpe Road be where she was a Domestic Servant as well as being her residential address?? Could the photo be that of 14 Upperthorpe Road. Does anyone have any photos of this property. Does anyne know who was the 1928 owner/head of this property and what was their professional status and what was the establishment. I have looked up the address 14 Upperthorpe Road on the 1911 census (date 2 April 1911) and the occupiers at the time were Mr and Mrs Batty with their family of four children. Mr Batty was a coal miner born in Killamarsh. Of course this may not be of any relevance to 1928. Also I have discovered that her older sister married in Chesterfield at the Registery Office date 1927. The couple were originally from Co. Durham and the husband was a coal minter. At the time of their marriage they were both living at 19 High Street, Killamarsh. Does anyone have any information on this address. I have looked through the on-line Killamarsh Heritage Society photos and there does not seem be anything like the building in the photograph, but 19 High Street does feature, looking like a family residential place. I would be pleased to hear from anyone who can give more information.